The United States is one of the most religious places on earth, but it is also a nation of shocking religious illiteracy. Nearly two-thirds of Americans believe that the Bible holds the answers to all or most of life's basic questions, yet only half of American adults can name even one of the four gospels and most Americans cannot name the first book of the Bible. Despite this lack of basic knowledge, politicians and pundits continue to root public policy arguments in religious rhetoric whose meanings are missed—or misinterpreted—by the vast majority of Americans. "We have a major civic problem on our hands," says religion scholar Stephen Prothero. He makes the provocative case that to remedy this problem, we should return to teaching religion in the public schools. Alongside "reading, writing, and arithmetic," religion ought to become the "Fourth R" of American education. Many believe that America's descent into religious illiteracy was the doing of activist judges and secularists hell-bent on banishing religion from the public square. Prothero reveals that this is a profound misunderstanding. "In one of the great ironies of American religious history," Prothero writes, "it was the nation's most fervent people of faith who steered us down the road to religious illiteracy. Just how that happened is one of the stories this book has to tell." Prothero avoids the trap of religious relativism by addressing both the core tenets of the world's major religions and the real differences among them. 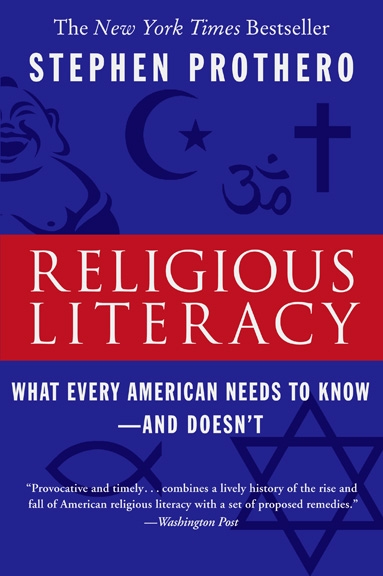 Complete with a dictionary of the key beliefs, characters, and stories of Christianity, Islam, and other religions, Religious Literacy reveals what every American needs to know in order to confront the domestic and foreign challenges facing this country today.